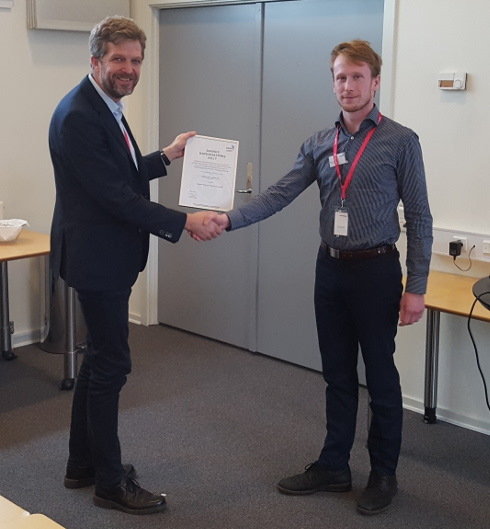 Allan Bjerg og Kristian Christoffersen wins this year''s DANSIS graduate award for their thesis "Numerical Investigation of Flow Structures and Their Impact on Heat Transfer Performance in a Staggered Arrangement of Rectangular Winglet Pair Vortex Generators in a Fully Developed Channel Flow". Again this year we had many very qualified contributions for the graduate award. 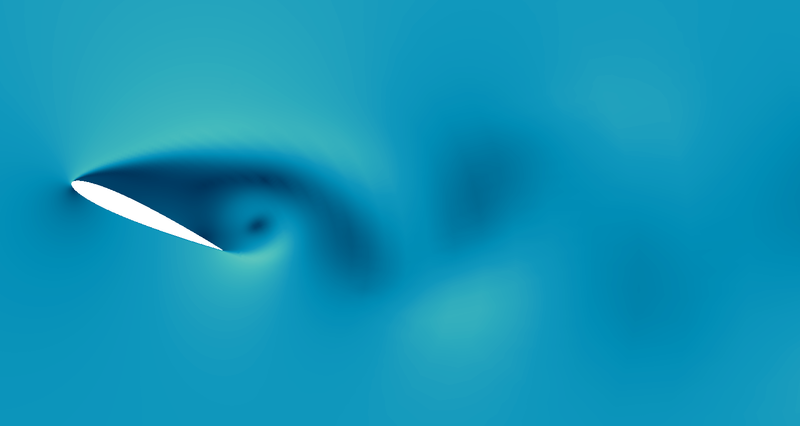 The winner of 2018 did an impressive study of flow structures around vortex generators and their effect on heat transfer. The structures was modelled using LES and the numerical model was validated against experiments with impressive accuracy. We congratulate Allan and Kristian with the award and thank all the candidates who have sent in their thesis for consideration for the award. 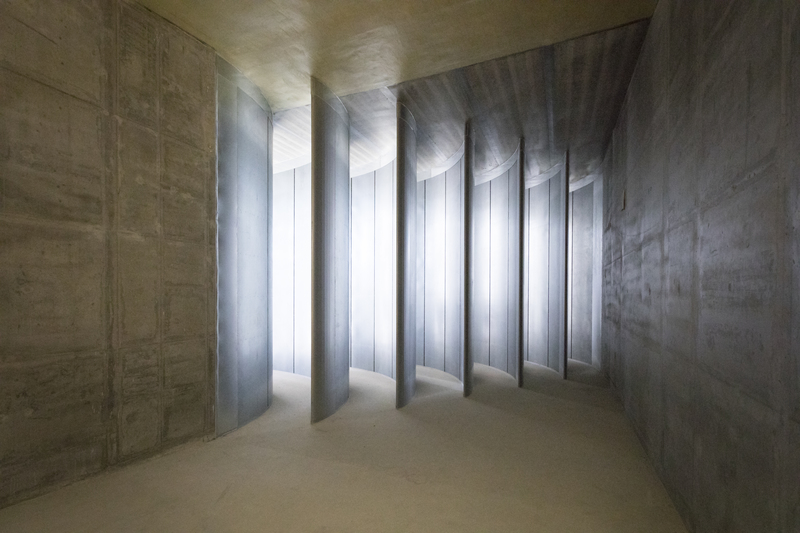 DANSIS invites you to a visit to the wind tunnel combined with an exiting seminar on experimental aerodynamics within wind energy. The seminar contains a wide range of presentations from Danish and international experts. Marcin Serdeczny wins this year''s DANSIS graduate award for his thesis "Infusion flow in composites processes". We again this year had many very qualified contributions for the graduate award. 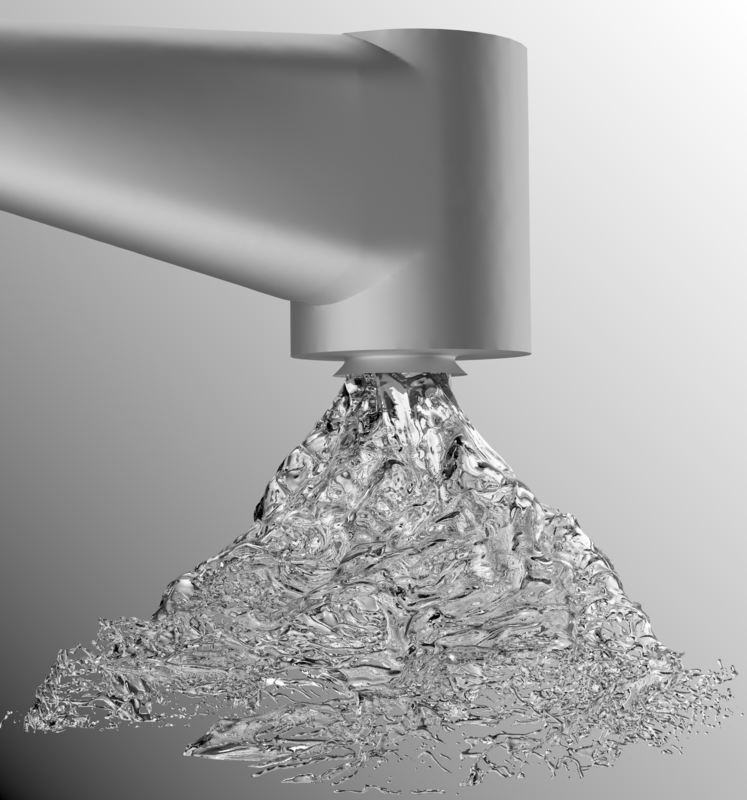 The winner of 2017 made an impressive study involving both experiments and coding his own simulations of the flow of resin in to composite materials. We congratulate Marcin with the award and thank all the candidates who have sent in their thesis for consideration for the award. 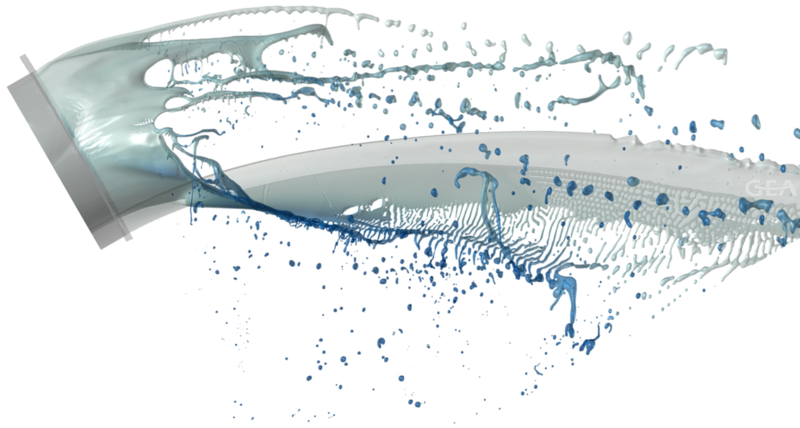 Henrik Mikkelsen and Mads Lund Steffensen wins the DANSIS graduate Award 2016 for their thesis "Full scale validation of CFD model of self-propelled ship". This year, we have again received many theses of very high quality to be considered for the award. 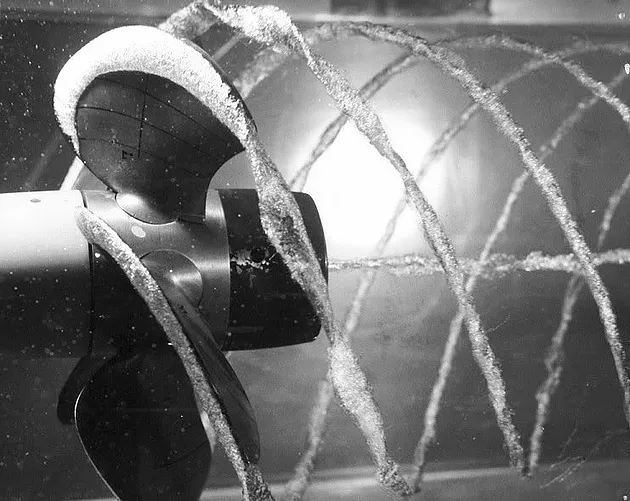 The winners of 2016 made an original combination of ambitious CFD simulations and comparison with real life data extracted by the students from full size ship trials. We congratulate Henrik and Mads with the award and thank all the candidates who have sent in their thesis for consideration for the award. DANSIS treasurer Kenny Krogh-Nielsen (left) and DANSIS chairman Knud Erik Meyer hands over the award to Mads Lund Steffensen and Henrik Mikkelsen (right). Read more on the DANSIS graduate award page, including links to the thesis of this years winners and from winners from previous years. 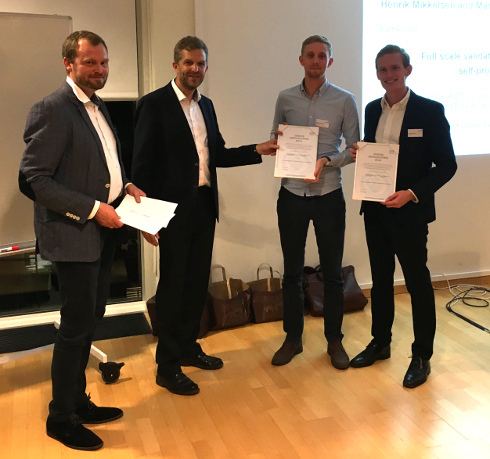 Robert Laugesen and Anders Mandrup Hansen wins the DANSIS Award 2015 for their thesis "Experimental Study of the Dynamic Response of the DTU 10 MW Wind turbine on a Tension Leg Platform"
The DANSIS committee received numerous very high quality master thesis. This year''s winners have made a very impressive experimental work combined with thourough theoretical analysis. 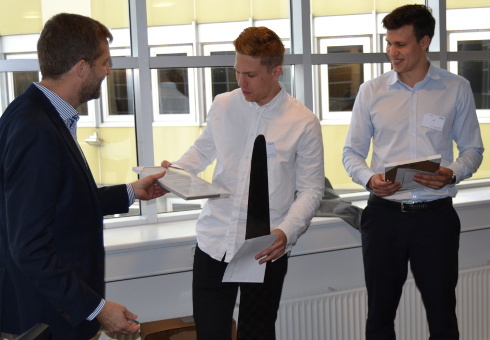 We congratulate Robert and Anders with the Price and thank all the participant, who have sent in their thesis for consideration for the price. 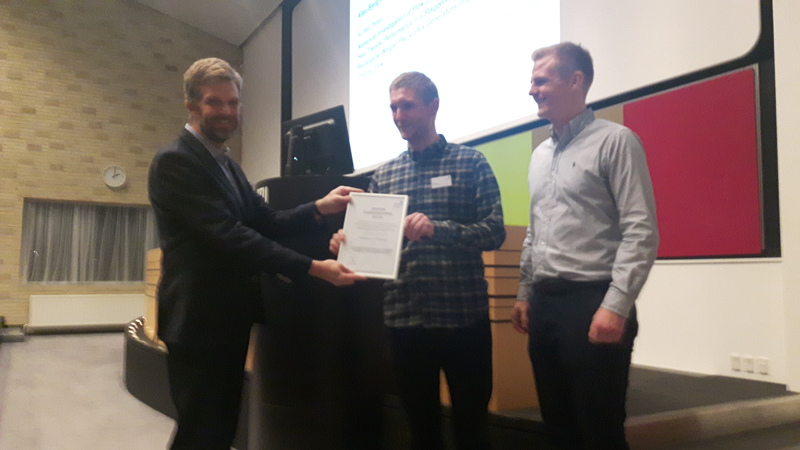 Robert Laugesen (right) and Anders Mandrup Hansen (middle) receives the DANSIS graduate Award 2015. The diploma and 15.000 DKK is handed over by chairman of DANSIS, Knud Erik Meyer. Read more on the DANSIS Graduate Award page, including links the the theses of this and previous winners.